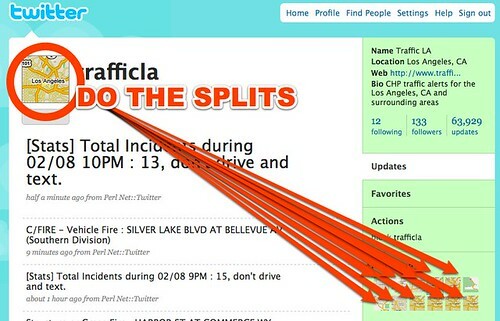 Those of you in the know are already following trafficLA on twitter, though hopefully not with text notifications on because damn that would be a crazy flood. This is something they know as well, and have split the account into 11 different subsections that focus on different sections of town like Central or West LA. This is direct from the CHP so it’s packed with useful info for all those commuters out there. This makes too much sense. If Metro is going to send duplicate tweets in different languages on the same account, how dare these traffic guys split things up so they can be more relevent? Splitting the city up into different Tweets would make Lincoln roll over in his grave… Bonner, you Confederate scum! Thanks for the post Sean! The follower counts jumped a bit after the posting. Previous PostPrevious Have you met TED? Next PostNext What up, dog? The only award show that matters.